Leesa mattresses are made from three performance foam layers build for comfort, contour, and foundation support. They offer direct-to-consumer sales to provide a value that most mattresses companies can't even get close to. This mattress brand is a serious contender for being the best on the market, and learning more about their brand and mattress might just help you make a better decision in your quest for the best mattress. 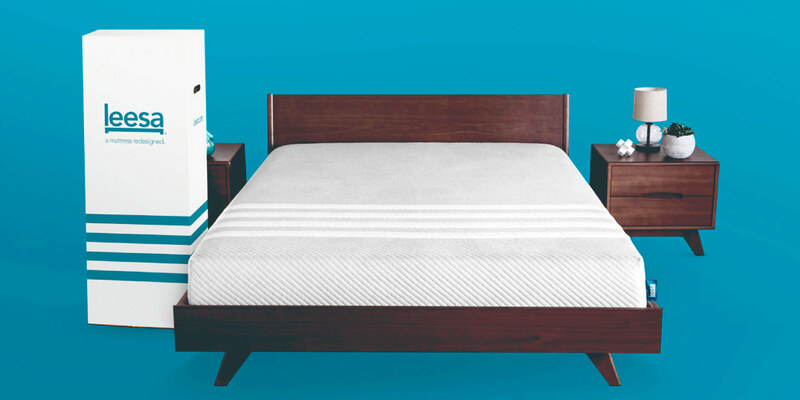 Leesa is a mattress brand that was started to help solve a problem. Their founders believed that the mattress industry had been charging exorbitant prices for products that didn’t really help anyone sleep better. Sleeping better, after all, is what the purpose of a luxury mattress is supposed to be. Since it’s beginning Leesa has worked tirelessly to reinvent what a mattress should be in the modern world. They’ve stripped out all the unnecessary parts and used modern technology to better improve the rest. What they’ve produced is one of the best mattresses on the market, and their reviews seem to back up the sentiment that they have positioned themselves as one of the best mattress brands today. Just for good measure, Leesa decided to sell their mattresses directly to consumers to cut out all the greedy middle men. This means that a Leesa mattress isn’t just more comfortable, it’s also more affordable. Traditional mattresses are cobwebs of pressure point causing springs, with ridiculous focus on stitching patterns and thread counts. While fancy embroidery certainly looks better sitting in the store, it doesn’t help you sleep better—and once you put sheets on it you can see all that fancy anyhow. Leesa is among a modern class of mattress brands that have re-imagined what a mattress should be, and what it should cost. Leesa has removed all the non-essentials from their mattresses and offers direct consumer sales. This means that not only are you not paying for stuff you don’t need, but you aren’t paying a middleman for a service you don’t need either. Leesa mattresses are made of three-layer foam construction, which each layer designed to offer support for specific needs. The first layers, a 2 inch thick ‘egg-crate’ type foam Lessa calls Avena, helps provide a bit of bounce and helps airflow to provide a cooler sleeping experience. 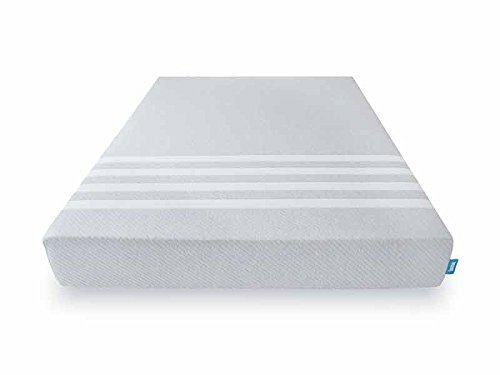 The next layer is a 2″ thick memory foam that helps to contour to the body, offering unique support for a myriad of different sleeping styles. The third layer is a 6″ thick dense foam that is meant to offer solid support and keep the top layers from sagging. 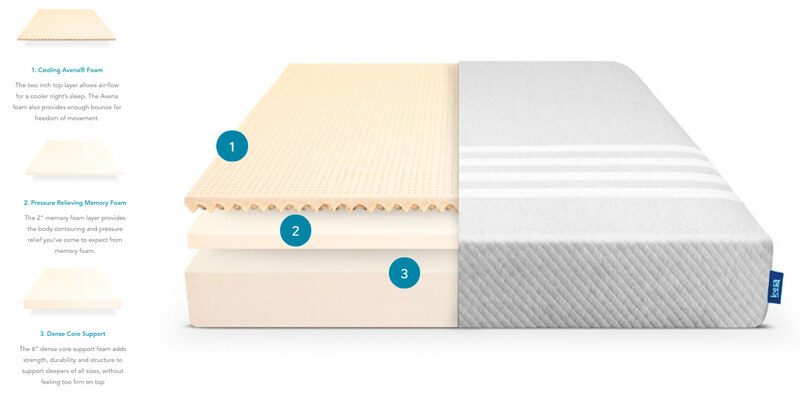 This three-layer composition allows a Leesa mattress to offer the air-flow benefits of less-dense beds, the contouring benefits of memory foam, and the supportive grace of a thick mattress foundation. Leesa Mattresses are made of 3 unique layers. 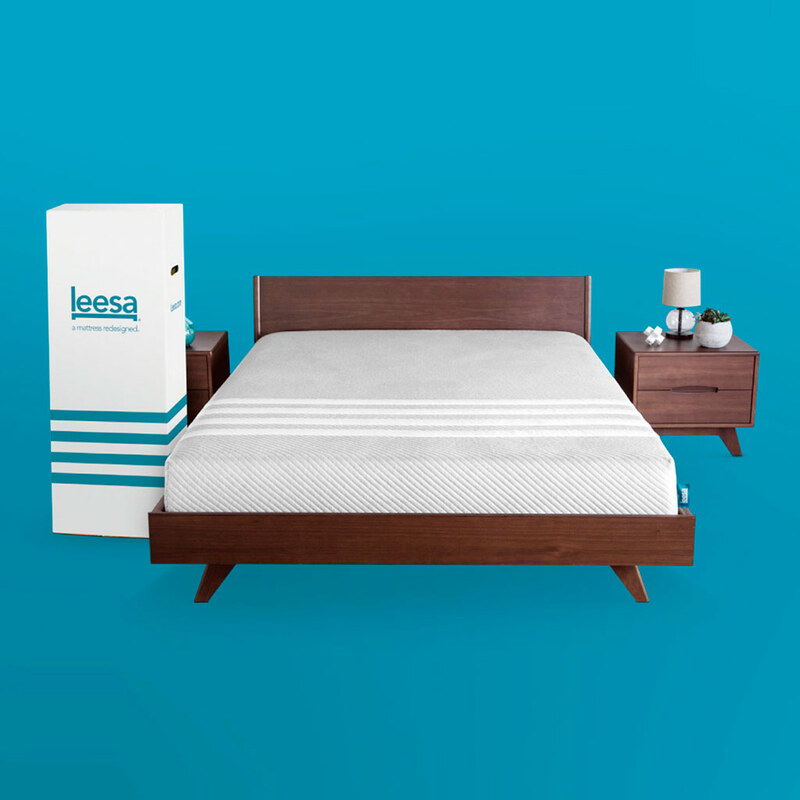 Leesa is among the best mattress brands on the market these days, and have helped to completely re-imagine how people use and shop for their mattresses. Their three layer foam construction offers the combined advantages of several material types. Leesa’s unique direct-sales business model allows buyers to get their products for hundreds of dollars cheaper than comparable products in stores. They offer free shipping on all of their products, a 100 night guarantee program, and free expedited shipping through Amazon’s Prime program. All around, these mattresses are among the best on the market and have been getting rave reviews by many—including celebrities like Michael Phelps (a Leesa brand ambassador). Quality sleep affects so many aspects of our lives, and for so long buyers have been forced to get sub-par products for their money. Leesa represents a powerful new approach to offering people what they deserve to be buying, while cutting out the middle man! Leesa is a remarkable mattress brand offering a product designed to replace the traditional inner-spring design. They offer direct-to-consumer sales from their website and Amazon, ship for free, and have a 100 night guarantee! With innovation like this, it's no wonder they are considered to be one of the best mattress brands on the market today!